Most of the atlas breeding codes are pretty self-explanatory, but there are a few that are a bit tricky. As the number of data submissions has increased, there are a few codes that clearly need to be better explained, so I thought I would mention the three that are causing the most problems. I’ll also point out that I think part of the problem might be the abbreviated definitions that appear in eBird – some of which are extremely misleading. All of the codes are explained more fully on the atlas web site, and I would urge everyone submitting atlas data to look over this page and read the longer descriptions. Problem code 1: CF. The code that has caused the most problems is CF (carrying food for young). Those last two words of the definition are crucial, because the code does not simply apply to any bird carrying food. Often when you see a bird flying around for more than a few seconds with a beak full of food, especially if it is going back and forth repeatedly to the same spot, it turns out that it is taking the food to its young. But birds do carry food for other reasons. First, some species will routinely carry food that’s intended for their own consumption some distance. For this reason, CF should never be used for raptors (hawks, eagles, osprey, falcons), corvids (jays, ravens, crows), kingfishers, or terns. If you see these birds carrying food, though, watch where they go – you may see them take the food to their young, in which case you will be able to confirm breeding using either the NY (nest with young) or FY (adult feeding young) codes. Second, many species of bird use food in their mating behaviour, with one member of the pair giving the food to its partner. Again, the CF code should not be used in these cases, but if you watch where the bird goes you might be able to observe courtship feeding (atlas code C). For example, I mentioned this behaviour in white-breasted nuthatches on the atlas blog yesterday, and it is a behavior I’ve observed in several other species already this spring. Finally, of course, birds will also carry food for short periods any time they eat – usually these instances are brief, but species like chickadees and titmice will take seeds from a feeder and then fly off to hide them in a crevice for later consumption. Since most birds do not feed their young with seeds, it is relatively straightforward to identify these cases as being unrelated to breeding. Problem code 2: P. Breeding code P (pair observer together in suitable nesting habitat during the breeding season) is also troublesome because it specifically indicates a mated pair, not simply two birds of the same species, or even a male and female of a species. For example, yesterday I saw two eastern phoebes together – I suspect they were a pair, but since the sexes look alike I cannot be certain they were even a male and a female. A little later I saw two eastern towhees together, but, although I could tell that one was a male and the other a female, I did not see them interact so I have no way to know whether they were mated. In these cases, using the P breeding code would have been inappropriate. Problem code 3 – S. Code S indicates a singing bird present or breeding calls heard during the breeding season in suitable nesting habitat. The simple definition (singing bird) seems pretty easy to understand, but it’s important to remember the longer definition. If a bird is singing but it is not yet that species’ breeding season or the bird is not in appropriate nesting habitat, then the code should not be used. Like many birders, I’ve been hearing singing white-throated sparrows in my yard for weeks. 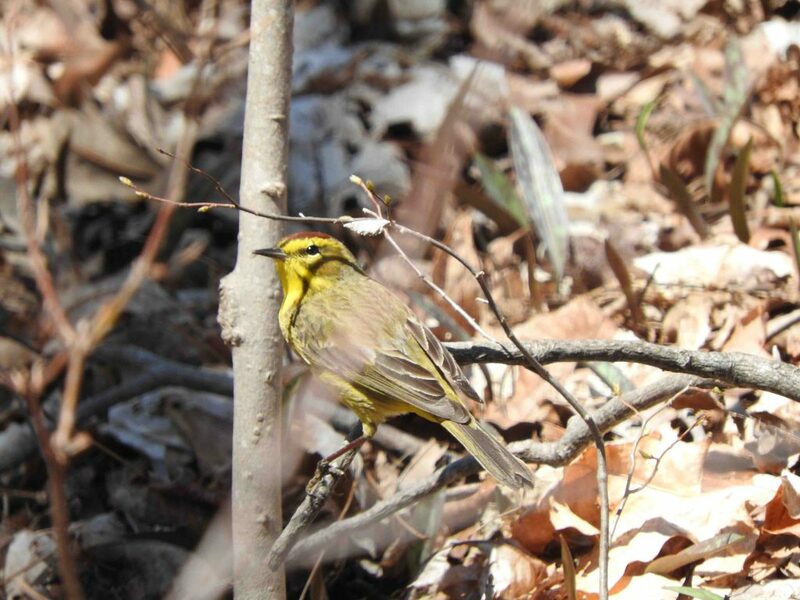 This species likely does breed in some parts of northern Connecticut, but my yard is not typical breeding habitat and these birds are almost certainly lingering winter birds that will leave before the end of May. Consequently, I will not use S for white-throats in my eBird checklists until late May when migration is over. Similarly, I’ve been seeing palm warblers and ruby-crowned kinglets in the past few days, some of which were singing. Neither of these species is known to breed in Connecticut though, and suitable nesting habitat is largely absent from the state. Consequently, the S breeding code should not be used for either species. In fact, in cases like these, it is best not to use any breeding code unless you can either confirm breeding (e.g., you find a nest) or until migration is over and we are within the safe dates for the species. (This is also why these species are not included on the atlas breeding season field card.) Of course, if you do confirm breeding for these species we’d really like to hear about it. This palm warbler is one of many I saw in Storrs yesterday. Palm warblers are not known to breed in Connecticut though, so I did not submit a breeding code even though I heard several singing.